"It was a thrilling spectacle. As I looked upon that brilliant pageant, I thought, `What a pity to spoil with bullets such a scene of martial beauty', but there was nothing else to do." MPAA Rating: Not Rated for Violent reenactments of Civil War battles. From The History Channel comes Civil War Combat, a four episode documentary series that focuses on four of the most important battles in the War Between the States; Shiloh, Antietam, Gettysburg, and Cold Harbor. In order to maximize the education of the viewer on the human element of each of these conflicts, Civil War Combat provides an overview of each battle but focuses on a specific killing field in each battle, describing in detail the battle chronology at each and the major participants who fought there. On location reenactment footage, interviews with prominent Civil War historians and National Park Service officials, dramatic readings of journals and letters, animated battle maps, and narration are combined in an attempt to bring each of these battles within a battle to life. The Hornet's Nest at Shiloh: Occurring on April 6th and 7th of 1862, Shiloh was the first major battle of the western theater. The Confederate Army of Mississippi, under the command of Albert S. Johnston, caught the Union Army of the Cumberland, under the command of U. S. Grant, in a vicious surprise attack near Pittsburgh Landing, Tennessee. All early indications pointed towards of a complete rout of Union forces, but Union Brigadier General William H. M. Wallace rallied his troops onto an abandoned wagon trail in the center of the battlefield and held there for several hours, bringing the seemingly unstoppable Confederate advance to a halt and saving Union hopes. This patch of trail later came to be known as the "Hornet's Nest" due to the ferocity of the fighting that occurred there. The Bloody Lane at Antietam: In September of 1862, the Confederate Army of Northern Virginia under Robert E. Lee invaded the North for the first time. The pursuing Union Army of the Potomac caught up with Lee near Sharpsburg, Maryland near a meandering stream known as Antietam Creek. What would follow would prove to be the bloodiest single day in the war. The famed Irish Brigade, under the command of Brigadier General Thomas Meagher, and other forces stormed a well-fortified sunken road full of 2600 Confederates, including the 6th Alabama regiment under the command of Colonel John B. Gordon. Several waves of Union soldiers were fought off before flanking fire made the Confederate position untenable. Soon the sunken road filled with Confederate dead and blood "flowed like a river" down what would soon be known as "Bloody Lane." The Wheatfield at Gettysburg: In early July of 1863, Lee again invaded the North, this time meeting up with the Army of the Potomac near the Pennsylvania town of Gettysburg. On the second day of the battle, with the lines of engagement already drawn, Union Major General Daniel Sickles disobeyed orders from overall commander George Meade and led his entire corps forward from its entrenchments into what would prove to be a maelstrom of Confederate fire. It soon became clear that additional Union troops would need to be engaged to support Sickles and prevent the destruction of his corps. Brigadier General John Curtis Caldwell was assigned to this duty. Having been recently promoted, this would be Caldwell's first test as a division commander, and it would be a ferocious test at that. His four brigades would enter the battles one after the other, fighting two entrenched Confederate brigades for possession of a 20-acre wheatfield on one of Sickle's flanks. The Tragedy at Cold Harbor: With the assignment of U. S. Grant as overall commander of Union forces in the spring of 1864, Robert E. Lee would soon come to realize that he had finally met a Union commander of sufficient mettle to face him, a commander who would not retreat from defeats and would continue on towards Richmond. Grant and Lee would clash several times over the weeks after the Battle of the Wilderness. On June 3rd, they would meet at a dusty little Virginia crossroads called Cold Harbor. There, Grant would make his most regrettable decision of the war, sending thousands of his men in a suicide-like charge against impenetrable Confederate works. This would be the first battle experience for several heavy artillery units, previously assigned to the defense of Washington. The 2nd Connecticut under Colonel Elisha Kellogg and the 8th New York under Colonel Peter A. Porter would be among these units, and they and their commanders would suffer dearly from Grants ill-advised decision. Viewers expecting a visual experience on par with the massive reenactments staged for the film Gettysburg are sure to be disappointed with Civil War Combat. The reenactment footage used in this series is on a much smaller, and less effectively choreographed scale. While, overall, the use of clever camerawork is able to overcome this deficiency, there are moments when the small scale hurts the documentary's effectiveness. For example, in two different scenes, Generals march their regiments towards battle but only 40-50 soldiers are in line, just a tiny fraction of the size of a real regiment. Occasional gaffes also occur. In the Antietam episode, two different reenactors with two different uniforms and two different haircuts play John B. Gordon. Furthermore, both wear the insignia of a Major General. Yes, Gordon would eventually achieve this rank but he was still just a Colonel at Antietam. For Civil War buffs, Civil War Combat should prove to be a worthwhile visual experience. However, I think the producers of the series tried to accomplish too much in each 45-minute episode. Too much time is devoted to the human element, the letters and journals and back stories of some of the participants, and detailed explanations of the battles themselves suffer as a result. Use of animated battle maps are too sporadic, and I didn't come away feeling like I had a thorough understanding of troop movements during these conflicts. 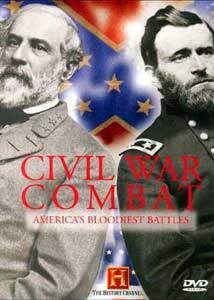 If you're like me and get enough Civil War-related books and videos, Civil War Combat should make a nice edition to your collection, despite its shortcomings. However, if you are looking for a thorough, near-flawless Civil War DVD set, I advise you to wait for the eventual release of Ken Burn's The Civil War PBS documentary series. Image Transfer Review: Presented in full frame, as is typical of documentary series originally aired on North American television, Civil War Combat: America's Bloodiest Battles features a solid visual presentation. Since the series is comprised of footage from several sources, video quality does vary slightly. Overall, however, each episode is presented with realistic color and a nice clean, albeit not exceptionally resolute, image with little sign of excessive blemishing or digital defects. Audio Transfer Review: Like the image transfer, Civil War Combats audio transfer is solid, but unexceptional, and pretty typical of a made-for-TV documentary series. Presented in digital stereo, the sound is crisp and clear and battlefield noises do not step all over Tony Jay's narration, or vice versa. Occasional LFE can be heard from cannon blasts and the like. Extras Review: Civil War Combat does not contain any bonus materials. English close captioning, but not subtitles, are included so you will need to use your TV's remote to turn them on. Both discs come in their own Amaray keepcase, packaged together in a decorative cardboard slipcase. Made with limited resources and suffering from some notable flaws and gaffes, the four-episode Civil War Combat pales in comparison to such documentary series as Ken Burn's The Civil War both in content and impact.